This collection of contemporary design bindings is travelling around the county from April until the end of September. 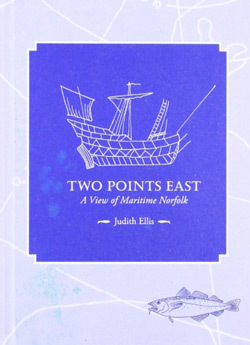 It was inspired by the author and bookbinder Judith Ellis who arranged for a number of unbound copies of her published book, Two Points East – A view of Maritime Norfolk, to be made available ‘in sheets’ for members of the Society of Bookbinders. One hundred and fifty-six copies were sent all over the country and some going to Germany, Australia and the United States. The result was an exhibition of twenty-eight bindings which were shown at the Society of Bookbinders Conference in Chester last year. 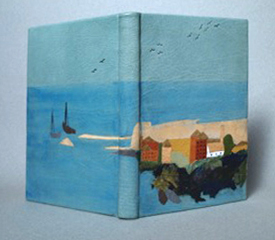 Twenty of these bindings have been lent for the summer to be shown at different venues around the coast. 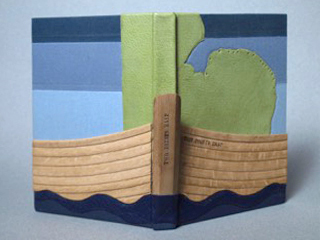 The books have been bound in many different ways, using leather, cloth, paper and even wood. 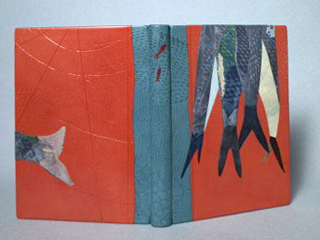 Some binders have used traditional techniques and some have combined digitally produced designs printed onto bookcloth and paper. All the designs are lively, colourful and beautifully executed, ranging from the exquisitely simple to the complex and witty. This is a rare opportunity to see the skill of the modern designer bookbinder applied to a book of great local relevance to anyone interested in Norfolk’s maritime past. 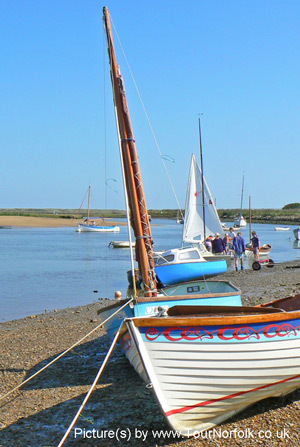 Two Points East was published in 2017 as a result of an extended sketching tour around the coast undertaken by the author which was to awaken a growing fascination with maritime history. The book covers the period from the Anglo-Saxons to the arrival of the railway when the days of commercial sail were finally numbered. It touches upon many different aspects of life on the coast over the centuries ,from the Hanseatic League to the herring fishery and from the life cycle of the eel to the extraordinary rescues of Cromer’s famous lifeboatman, Henry Blogg.